In his review for ReelViews, James Berardinelli insightfully compares Insidious to David Lynch's Twin Peaks. The comparison is especially illuminating when you consider the final episode of Twin Peaks... Agent Dale Cooper's descent into the madness of the Black Lodge to rescue an innocent soul; a confrontation with a devious presence, and the uncertain possibility of return. Lots of reviewers praised the suspenseful, haunted house setup of the first half of Insidious, while panning its second half, in which it turns into sort of a surreal malevolent netherworld adventure story (yes, the production design was a bit ghostbustersy, but we'll let that slide for the moment). It's baffling that these reviewers liked that first half so much, when it depended so heavily on the most basic genre formulas... figures appearing and disappearing, quick movement across the field of vision, slow POV shots through doors and hallways, sudden laughter and creaky noises, and spooky shadows and children. It was The Others, The Grudge, The Changeling, The Shining -- it worked fine to unnerve us a bit, prove to us that the director could set up suspense and then disperse it in nice time-release bursts -- but it was pretty much straightforward genre path-tracking. But the second half of the film, which they called outlandish, over-explained, and silly... that's where the genuinely frightening ideas started to come out, and where the film got adventurous. The reviewers thought the explanation killed the suspense and the mystery, but the more I thought about it, the more it occurred to me that it's the explanation that suggests the most frightening possibility: the promise of an endless, ticking, static abyss awaiting our minds when they stray from our bodies. This conceptual horror story starts with Elise's explanations, and if you're not keyed to really think about it, it'll all pass right by you. Astral projection isn't a scary thing unless you start to imagine it as an extension of your weirdest, most confusing nightmares... as with Dalton, who thinks he's dreaming when he travels. And it doesn't seem dangerous until you consider the fact that, as Elise tells Josh and Renai, as you wander further from your physical body, you gradually lose your connection to it, and it becomes an empty vessel. I think I was especially susceptible to this suggestion because of my own fascination with David Lynch, Renee Magritte, Jorge Luis Borges, and the whole general idea of being alienated from yourself. For someone who thought this film was just a tossed-off spook story, this may sound like interpretive overreach, but the theme is actually buried very deeply in the film. The photography motif, for instance? Photographs trigger this anxiety, the fear that your selfhood can be stolen from you and captured in a box hung around somebody's neck. There are all sorts of folk stories about foreign cultures, where people think that a camera can "steal your soul" (read a brilliant piece at StealingSouls.org to understand how this belief says more about the people who attribute it to primitive cultures than it says about those cultures themselves). And just as cameras capture souls, so Dalton's soul is captured by the man with fire on his face, his essence ripped from his body like Peter Pan's shadow. In Insidious, it seems as though some of those "tortured spirits" can only appear as images. The family, murdered by one of its daughters, never moves on-screen except in jump-cuts, and their faces are constantly flicking into grotesque smiles, as if they're always stuck on a strip of film. Other apparitions seem more corporeal; nonetheless, they're often seen through frames: doorframes, windows, or through the veil hanging over a crib. In the real world, their appearances are always mediated. So Insidious is about characters alienated from themselves, astrally projecting and repressing memories. Further than that, though, it's about a world alienated from itself: when Josh, hypnotized into a trance, steps out of his living room, he finds himself looking into the family's previous home, which they fled in order to escape these bad vibes. That home, with its spiritual hazards, becomes the projection of a shadow world, and Josh has to step into it to find his son. This is the film's Black Lodge, the dark side of the threshold, and we can gain some insight by looking back at Lynch's work. Infamously, Lynch's Black Lodge harbored shadow-selves of the series' main characters: a version of Laura Palmer with milky white eyes, a version of Dale Cooper with a menacing smile, joyful in his emptiness. There is a similar symmetry in Insidious, and it's between two powerful paternal presences: Josh, the guardian father, on one hand, and the creature called Lipstick Face Demon, on the other. Is it possible that this is Josh's shadow-self, left over from his own travels into the Further when he was a child, matured into something sinister? This isn't obvious on first glance, but it's worth considering. Josh, as a parent, has sort of an absent spirit. He can't pick up Dalton from school at the beginning of the film; he starts escaping into long hours at work when things get difficult. He's the last of the family to realize the true nature of his son's problem. The Demon, on the other hand, is the inverse evil aspect of Josh's slow-moving fatherhood. Instead of being disengaged from Dalton, the demon is obsessively interested in him -- especially in exploiting him. It hovers around Dalton's bed, demanding the use of his body, menacing him and intimidating his family. He seems to know Elise, and even to have some connection with Josh's mother. Are these really the actions of some random demon who happened upon a lost spirit? 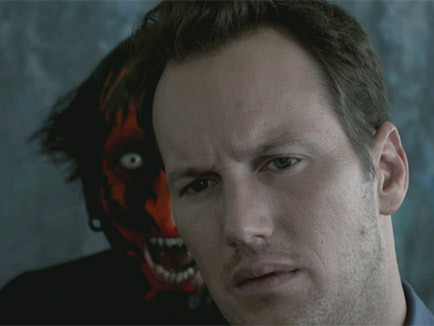 Insidious is a broad film that's much more complex than it seems on the surface. Not all signs point to this parity between Josh and the Demon, but there are some other signs of a connection between them. Both are shown, at key moments, huddled in empty work-spaces: Josh isolates himself in his classroom to escape his responsibilities at home; the Demon tinkers in a workshop whilst keeping an eye on Dalton. Again, this is the contrast between them: the ghostly, absent father versus the overbearing warden, watching for a weakness to exploit. And of course, there's one of the most commonly captured shots of the film, where the Demon's face is juxtaposed with Josh's, as seen through his mother's eyes. The symbol of the flame is the final, cockeyed piece of this puzzle. The ghost of an old woman, a parasite that follows Josh, is almost always shown hovering over a lit candle, and at the end of the film -- after Josh has apparently been possessed by her -- she is seen blowing it out (much like Agent Cooper empties the toothpaste tube at the end of Twin Peaks). The demon surrounds itself with candles, and Dalton calls him "the man with fire on his face." My full reading works out something like this: when Josh was a child, he ventured too deeply into the Further (just as Elise says), and was followed back by a parasitic spirit (the old woman). However, in repressing his ability to project, Elise actually cut Josh off from a part of himself (represented by the flame) -- and over the years, that fragment developed into something aggressive and hungry, burning with resentment, and eager to return to its family of origin. It developed a hatred for Elise, who had cut it off from its source personality, and it developed a desire to control Josh, and to possess Dalton, his son. And it lingered around the family, waiting, until it discovered that Dalton could wander out into the further, where he could be placed in chains. And finally, by returning to The Further to rescue his son, Josh facilitated his reintegration with his demonic offshoot, and they merged and vanished into the spiritual abyss. And the only witness to the self destruction of the Josh-Demon entity was the spirit of the old woman, who gets to inhabit Josh's body, and finally, blow out the candle of his fragmented soul.